For dinner tonight, I cooked mostly with I ingredients from the local farm. I used hot sauce from this week's basket to marinate the chicken. 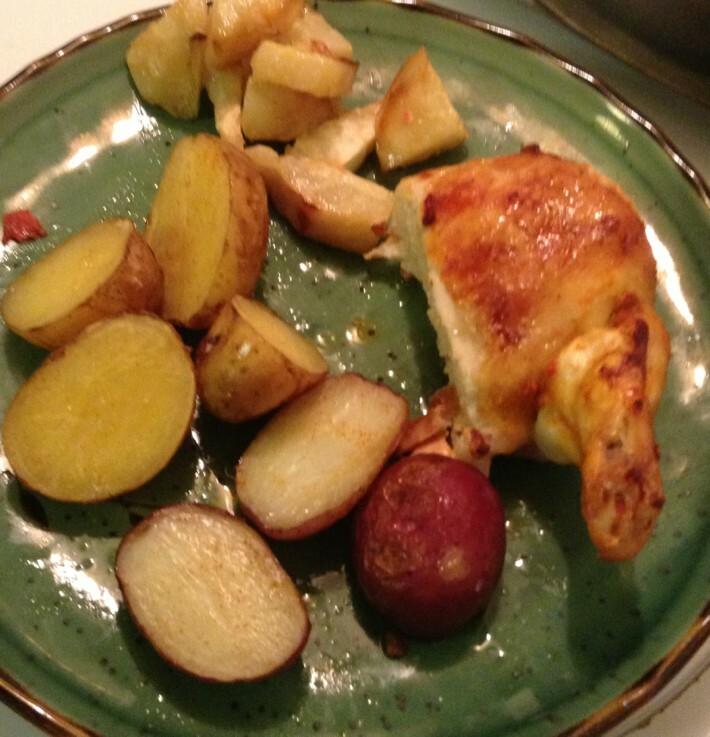 Next to the chicken are roasted red potatoes and Yukon potatoes. At the top of the plate is roasted celery root (celeriac). I don't remember having celery root before. It reminds me of turnip - both in taste and appearance. For dessert, I made another strawberry rhubarb cobbler. As I still had lots of rhubarb, I chopped and froze the rest. Other plans for this week's basket? Stir fry chicken with asparagus and snow peas. I'm thinking that a celery root, potato, and kale soup would be pretty good. But I might need to chop and freeze the kale soon. I use Celery root whenever I make chicken soup. It gives the soup a great flavor. I don't think that I've had it prepared any other way. It was quite tasty roasted. I cut it up and roasted along with the potatoes. I'm thinking of using the remaining celery root, potatoes, and kale in a soup.